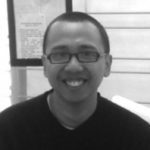 Frans Ari Prasetyo, he works as a independent researcher, using a methodology that is strongly community-research based and relies on urban culture/planning, visual anthropology/ethnography. He is primarily interested in urban-rural landscapes, visual knowledge and visual culture. He typically uses photography, photo documentation, film and video to tell stories and augments this with ethnographic information that he collects in the field. He has worked extensively in urban areas with a focus on Bandung city, but gas also been involved in rural and indigenous projects like in Sumatra, Nias Island, Borneo and Sundanese indigenous people. His main interests are the evolution of urban public space, architecture (vernacular), arts/culture, urban politics/activities and sub-cultures such as punks, artists, underground activists and indigenous people.